I just posted to paintings in the Oregon Endangered Species series: Marbled Murrelet and Western Snowy Plover. They are 12 x 12 inches each. 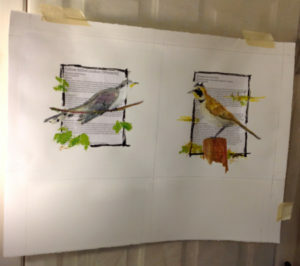 The photo below shows the Streaked Horned Lark an Yellow-billed Cuckoo fresh off my easel. They are on my “drying wall”. I will photograph them after they have dried a little. They are also 12 x 12 inches. So, what if you were the last one of your kind on earth? It’s strange to think about; almost inconceivable (i.e. hard to wrap ones head around). I am adding more work to my series called The Last One Standing?. I started the series when I was in graduate school. It’s paintings of animals that are on the Federal Endangered Species list. They are on the brink of extinction. One of them may really be the last one standing. It’s a sobering thought, to be the last one. In the grand scheme of life on this planet, species come into, and others go out of, existence. I feel sad when it is we humans who are responsible for their demise. 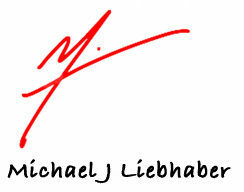 However, I use a question mark in the series title because some species have come back from the brink. That’s nice. I live in Oregon, so I am painting Oregon endangered species (I painted Connecticut birds when I lived there). Why birds? No reason. I will include other animals in the future. The first two I chose are the Marbled Murrelet and the Western Snowy Plover. 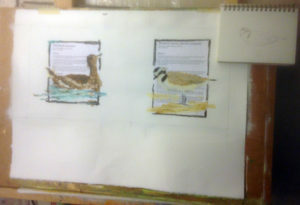 I incorporate printed information about the animals into my paintings; their habits, habitat, and so on. They are oil on paper, 12 by 12 inches. The photo shows them still on my easel; just finished! I have returned to a theme I love, wild animals. I created a successful series of endangered birds while I was in graduate school in Connecticut. I live in Oregon, now, so my first few paintings will be endangered birds in Oregon. You can see them in my artwork pages. The first two I chose are the Marbled Murrelet and the Western Snowy Plover. I incorporate printed information about the animals into my paintings; their habits, habitat, and so on. 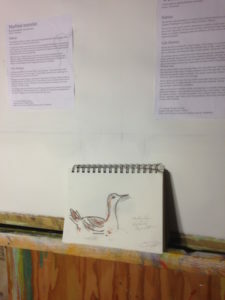 That’s what’s in the photo, along with a drawing of a Marbled murrelet in my sketchbook.